The executive Cigar Accessories Gift Humidor set Great gift for your Boss, Or any cigar lover in your life. 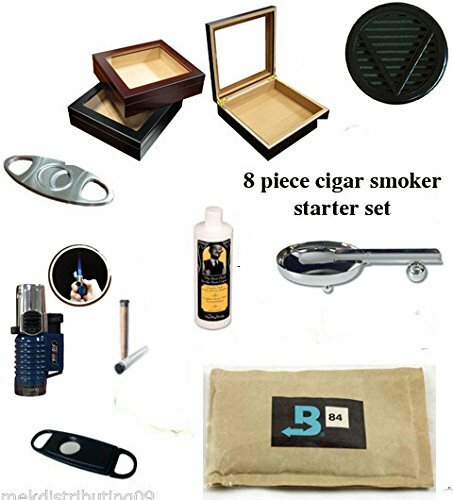 Each unique cigar gift set contains the following Quality items:Humidor Capacity 20 Cigars *Glass top cherry Finish with brass hinges * Humidifier * Spanish Cedar Lined * 9" W x 8 1/2" D x 2 1/4" H* Triple Flame Torch lighter, Lock For Continuous Flame, Wind Resistant, Butane Refillable, Adjustable Flame Height. (NO FLUID, MY CHOICE OF COLOR) *Cigar cutter # 1 - Double Bladed silver Metal Guillotine Cutter. *Cigar Cutter # 2 - Single Blade Black Guillotine Cutter. * Humidification Solution - Cigar Caddy 50% Mix of Propylene Glycol 50% Distilled Water 2 oz. Bottle. (1) Acrylic/Plastic Clear Tubes - With Cap 6 1/4in Length Holds Up To A 52 Ring Gauge Cigar *Stainless Steel Cigar Ashtray-Holds 1 Cigar- Lightweight Construction- Modern Design- Cigar Ashtray is 6"L x 2 1/2"W x 1 1/8"H Weighs 1/2 lb. *The Boveda 84% One Step Humidor Seasoning Kit is the perfect way to season that new humidor correctly. Making sure your humidor is properly seasoned is crucial to the storage and flavor of your cigars. This will essentially moisten the inside of your humidor properly so it will be easy to maintain that perfect 70% humidity on the inside giving your cigars the best environment possible. To use, simply add one 84% pack for every 25 cigars the humidor is capable of storing. For example, you would need four 84% packs for a humidor with a 100 cigar capacity. Once you have put all your packs inside your humidor, close the lid and leave it alone for 14 days to allow proper seasoning. After 14 days, remove the packs and then use the humidifier of your choice to maintain the proper humidity levels. You will want to use a hygrometer so you can monitor the levels of humidity inside your humidor. If you have any questions about this product by MEK-Distributing, contact us by completing and submitting the form below. If you are looking for a specif part number, please include it with your message.